Angelica's Cleaning Services - ALL YOUR CLEANING NEEDS - We have the experience and expertise! 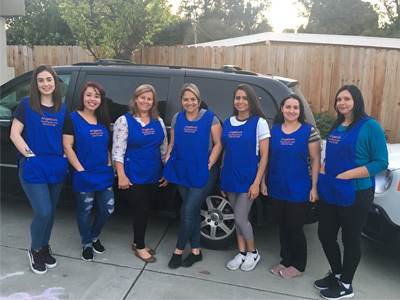 Angelica's Cleaning Services is a company with professional and qualified cleaning team providing all kind of cleaning services to meet exactly all your cleaning needs. It can also be called household management, which is the act of overseeing the organizational, financial, day-to-day operations of a house or estate, and the managing of other domestic concerns. How do we take care of home and family? With lots of love, lots of passion, and lots of help! We proud ourselves to really understand completely all these family needs, and our professional, trained and qualified team will help you take care what's most important in your life. Angelica's Cleaning Services is yours Top Rated Cleaning Company that will make this commitment with you as usual 100% responsibility for your complete satisfaction. We are a local company focused on Quality and Customer Satisfaction. We really help busy people by offering complete RESIDENTIAL CLEANING services. Serving Alameda, Orinda, Lafayette, Moraga, Walnut Creek, Berkeley, Oakland and surrounding areas. We also specialize in Post-Construction Cleaning and Large Homes Management. "We proud ourselves to really understand completely all these family needs, and our professional, trained and qualified team will help you take care what's most important in your life. Your Home and Your Family."